Why do we have regulation of food labelling? It is necessary in order to have a standardised method of conveying information to the consumer and to ensure that the information is truthful and not misleading. What information do I need to have on my labels? Letter sizes for some items need to be in a designated font size and / or in a bold and / or uppercase font and positioned in a certain place. Your product name and descriptor need to be on the main panel in letters at least 4mm high. If your product name does not clearly indicate what the product is, you need to add a descriptor in letters at least 4mm high. Certain products falling under the Agricultural Product Standards Act also require so-called class designations and you should refer to the relevant regulations under the Act to obtain these. The address of the manufacturer, seller or importer must be on the label. It must be a local physical address but you can add a PO Box, a phone number and a website as well if you wish. For importers, just putting the address of the overseas manufacturer on the label is permitted in terms of the DoH regulations but may be seen as unacceptable under the Consumer Protection Act. It is therefore preferable to rather have a local address on the label. Your ingredients need to be listed in descending order of quantity including all additives. Herbs and spices, vitamins and minerals can be shown in any order at the end of the statement. There are a lot of special provisions relating to the way in which an ingredient statement is put together, particularly in regard to food additives, and these are listed in regulations 16-41 of R146. Do I have to say how much of the different ingredients are present? There are new provisions that require this for so-called emphasised ingredients using the term Quantitative Ingredient Declaration or QUID. Regulation 26 and Guideline 3 of R146 set this out in detail and it is complicated so get help if necessary. It is particularly important to note that raw processed meat products have to have the percentages of meat and water in the product declared on the label in bold capital letters at least 3mm high. How do I declare products that are allergens? Food allergies are a very topical and complex subject and have been extensively addressed in the new regulations under regulation 43-46 and Guideline 2 of R146. You have to declare the presence of allergens such as wheat, soy and nuts on the label in a prescribed format and special label declarations and procedures apply to products which may possibly become contaminated with allergens through being manufactured, stored or distributed in the same facilities where allergenic materials are also present. You need to consider putting in special procedures to control potential allergen cross contamination in your facilities as you could be liable under the Consumer Protection Act as well as food laws if a consumer is affected by an allergen in one of your products. Some consumers have strong views on this subject consequently the new regulations require that information on country of origin be declared on the label. The requirements are covered by regulation 10 of R146. There are several options depending on where the ingredients, processing and packing of the product concerned have been carried out and a new regulation still to be published is expected to make provision for situations where raw materials are sourced from a number of different countries and the source may vary on a seasonal basis. The new regulations require that all labels carry a batch code which will enable the product to be traced in the event of quality or safety problems that might necessitate a recall of the product from the trade. The new regulations require almost all food products to carry date coding (N.B. unprocessed non-prepacked meat and poultry are exempted). There are several specific formats of date coding permitted depending on whether the product is of a perishable or non-perishable nature. Can my date code also function as a batch code? Yes, providing the nature of your operation is such that your date code can be used to trace individual batches of product. Note also that, while it is a requirement that the date code be in a format that is understandable by the consumer, the manner of batch coding is not specified and does not have to be in a consumer-friendly format. The new regulations require that all products carry a statement of storage instruction both before and after opening of the pack in bold, upper case letters at least 3mm high. The normal weight declarations required by the Trade Metrology Act are of course required on every label. Note that there are some specific font size and other requirements for these. So those are the basic requirements. What other requirements are there for promotional slogans and other marketing material on labels? 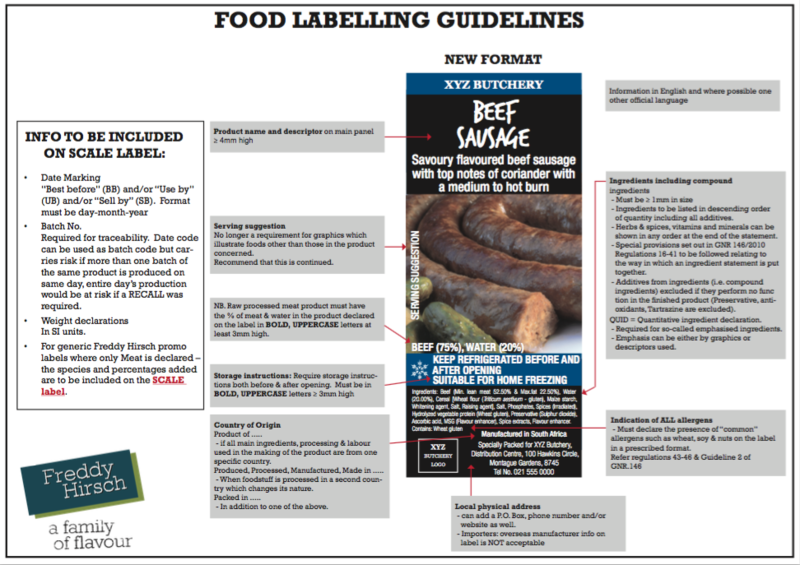 It is firstly very important to remember that the regulations relate to labelling AND advertising of foods so you need to consider them when designing the promotional components of your labels and also when planning your advertising. Those of you who use advertising and design agencies need to ensure that they are also familiar with the regulations. There are a lot of components of the regulations that deal with advertising and promotion and these are intended to ensure that the consumer receives truthful information and is not misled. Unfortunately many companies have in the past been guilty of making exaggerated and even untruthful statements about their products and the new regulations aim to correct this. What are the main issues relating to control of advertising and promotional components of labels? There is an overriding requirement that both the statements and the pictorial representations on labels must be truthful, honest, not misleading and capable of being substantiated where necessary. Can I use the words “Serving Suggestion” next to my graphics in order to protect myself? It is no longer a requirement to do this for graphics which illustrate foods other than those in the product concerned but it is highly recommended that you continue to do this in order to avoid misleading consumers. Can I have celebrities and organisations endorsing my product? Individuals may endorse the general acceptability of the product but may not provide endorsements relating to the nutritional or health benefits of foods. Certain endorsement bodies such as the Heart Foundation will be allowed to continue endorsing food products but there are stringent requirements for endorsements relating to nutrition and health and some organisations will probably no longer be able to do this. You should refer to regulation 13 of R146 and get expert advice. Can I claim my product is free of MSG, tartrazine and other “nasties”? First of all, these are not “nasties” but perfectly safe and well regulated food additives! However some consumers like to receive this sort of information but there are strict controls on the sort of statements you can make in this area. Regulation 14 of R146 gives full details and you may need to get advice. What words can I specifically not use to describe my product? “Health”, “Healthy”, “Wholesome”, “Nutritious”, “Balanced”, “Cure” and all similar words are specifically prohibited. There are also strict guidelines for the use of words such as “Fresh”, “Natural”, “Traditional”, “Pure”, “Original”, “Home-made”, “Quality” and other similar words in Guideline 7 of R146. In particular the use of “Natural” is strongly discouraged as it is virtually impossible to meet the criteria set out for its use. These are tightly regulated and you should refer to regulations 50-53 of R146 which are very comprehensive. Note that if you make a nutritional claim for your product, you are required to supply comprehensive nutritional information on the label in a prescribed format and using specific procedures to obtain the information concerned. Do I have to supply nutritional information on the labels of all my products? No, unless you are making a claim as stated above. However, if you decide to supply nutritional information anyhow as a service to your consumers, this must be set out in a prescribed format and using specified procedures. Note that these differ in certain respects from that required for nutritional information required to substantiate claims. You should also be aware that nutritional labelling is likely to be compulsory on most foods, irrespective of whether or not you are making a claim, within the next couple of years and, if you are considering updating your labelling for a product that does not currently have nutritional labelling, you should consider incorporating it now in order to avoid having to make further artwork changes when the law changes. How do I obtain my nutritional information? It is quite a complex process and we suggest you get expert advice to interpret the particular requirements of the regulations if you are not familiar with this area. What products are excluded from some or all of the new regulations? There is a list of exempted products in regulation 54 of R146 and some other specific exclusions from particular components of the regulations, particularly for products packed in small packets with limited space for information. Where can I get help on preparing my labels? Freddy Hirsch can help you with simple queries but for more complex issues you may need to get additional specialized help. Freddy Hirsch can advise you how to obtain this. If you are a member of the Consumer Goods Council of South Africa (CGCSA), they may be able to help you but they have very limited resources. The Directorate of Food Control of the DoH, who prepared the new R146 regulations, are extremely short staffed and are unlikely to be able to provide assistance. There is no point in asking the DoH to approve your labels before you go to print as they do not offer this service. For regulations falling under DAFF however, it is actually recommended to get approval from them before printing. You will need to approach your local DAFF inspection office for this as it is no longer done centrally from the DAFF Head Office. Note that the DAFF staff will ONLY comment on issues relating to compliance with regulations falling under their jurisdiction and will NOT check labels for compliance with DoH or DTI administered regulations. Different product or processing standards can also be obtained for a fee from SABS.